Despite the wettest weather on record, there have been some impressive achievements recently, including an epic Silver distancein the mountains of the Lake District, flown on a task never previously undertaken by a Bronze pilot; an aerobatics world record for a 13-year-old; and a UK Nationals double. Also impressive is the prospect of flying at 90,000ft; the Perlan Project is building a glider capable of soaring at the edge of space. You can read about all of this, and much more, in the Aug-Sept issue of S&G. 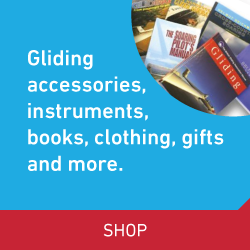 Invited to join Peter Whitehead’s annual gliding expedition to Latrigg, near Keswick in the Lake District, Frank Bradley found he gained confidence with each mountain flight. When Peter suggested that he undertook a distance task never previously undertaken by a Bronze pilot, Frank had no hesitation in taking it on – and succeeding. Derren Francis is enjoying the feeling of being “up amongst pilots who you have admired for such a long time”, having won both the 15m Nationals at Lasham and the 18m Nationals at Husbands Bosworth. Memorable moments include going through the start line at the 18m Nationals and being confronted by a downwind 45km glide to the only cumulus in the sky. 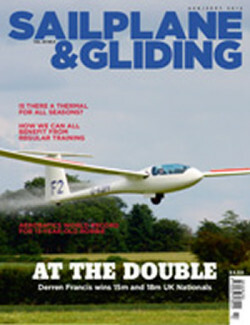 Regardless of whether you are just starting out in the sport or compete internationally, everyone can benefit from regular trainingsays Bernard Eckey, who also explains how mixing with top achievers can positively influence our commitment to gliding. He says top achievers simply do things more thoroughly and professionally than everyone else and an undivided commitment is a big part of this. 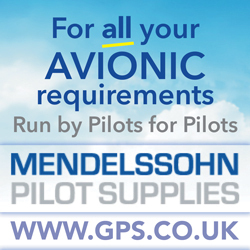 Our sport tends to reward deeply committed pilots with better flights. Alan Lapworth has examined records of flight times, both from a local club and from the BGA National Ladder, as part of his investigation into how thermal strengths vary throughout the day and at different times of the year. So, is there really a thermal for all seasons? Imagine flying at 90,000ft – that’s what Perlan Project pilots hope to achieve, with a glider capable of soaring at the edge of space. Jens Trabolt reports on the development of the project, which aims to document the influence of mountain wave on global circulation. Also in this issue: Pete Stratten explains the importance of everyone understanding the issues before making a transition to EASA pilot licensing, medical or training requirements. Tony Hoskins tells the behind-the-scenes story of building a replica glider in the original workshop space of Colditz Castle. Jean-Marie Clement reports on an eventful Patagonia season. Southdown’s Craig Lowrie describes how the club achieved its goal of a cost-effective solution to better security and avoiding the need to rig, with its new 18-glider hangar. Andy Davis announces a new development for Jonker Sailplanes’ JS1, about to makes it debut at the Worlds in Uvalde. David Clark explains why we should forget glidingspeak and talk to club visitors in English. Mike Fox and Malcolm Taylor continue their discussions on training methods. We celebrate George Brown achieving an impressive 10,000 aerotows and report on a busy Air League Flying Day. BGA Development Officer Alison Randle announces a change of scene for the Club Management Conference. Don Puttock looks at the value of recording ‘unplanned events’. We’ve a salutory soaring tale, plus even more of yourtruly stunning images in the Gallery pages. A summary of the accident report would have read: “Downwind approach, hit upwind airfield boundary wall”. So how did our anonymous contributor get themselves into that position?